When you go through the auction sites, seeking to buy a vintage watch, it’s beyond a doubt that what will catch your eye are the pieces, which look as if they have rolled out of the factory only yesterday. In some cases, these might be specimens, which survived a few decades in a truly immaculate condition. Sometimes you’re dealing with timepieces, which have never been sold. Or at least never have been worn by whoever bought them these few decades ago. But in a vast majority of cases, these dials are repainted. This article explains how to spot a redial so you can avoid them. First of all, do your research. This applies to absolutely every aspect of watch collecting, as long as you’re not buying a brand new watch from an authorized dealer. Look at other specimens of the watch that you would like to buy. Look for consistent patterns, the size, and the shape of fonts, if they are consistent with the font that a particular brand used at that time, and so on. Examine the dial variants that a particular piece has existed in. If you stumble upon something that just doesn’t look like it gets along with the overall quality of the products of the brand, it’s very likely that that’s because it’s not the factory that did it. Keep in mind one thing, a redial and the real deal are never fully identical. Some difference might be hard to spot but they’re always there. A redial of ordinary quality will always show certain signs which you can spot immediately. The first of these signs is paint creeping up the hour markers. If the markers are applied, then the vast majority of redialers won’t bother to take them off before repainting the dial. This results in paint covering the sides of the markers, creating an impression of the markers almost sinking into the paint. Or at least the area around the markers will have an odd shine to it. A badly aligned (off-center) minute track is the next thing to be extremely careful about. Always check if the distance from the track to the edge of the dial is even at all hour markers. If it isn’t, walk away from this one. Of course, there are exceptions, like chronograph movements with the subdials placed at different distances from the center. That’s the case with certain movements by Landeron. The distance between the subdials and the track will, therefore, be different. However, in a non-chronograph watch, this is a sign of a redial. Let’s move to another feature, patina. Patina can either form due to discoloration of paint due to age or exposure to various factors like sunlight, smoke, dust, etcetera. As you can see, the font is crisp, the minute track is correctly applied, and the black paint has slightly faded. The lighter areas in the dial suggest that the dial was originally silver. Is patina a guarantee of authenticity? Absolutely not. Old redials do exist. By the ton. People often buy them, firmly believing that they’re the real deal, based on nothing more than patina. Patina can be a sign of originality but that doesn’t mean that you don’t have to investigate the watch any further. Pay attention to the fine print in the listings. You could easily miss phrases like “original, refurbished (now that’s an oxymoron) dial”. Nevertheless, from a legal standpoint, if the seller doesn’t accept returns without a reason, you could land up with a redial. Stay away from sellers who do not mention the fact that it’s a redial, when it clearly is one. Redials are extremely common among watches from countries with a hot, humid climate. Generally, you’re almost always better off avoiding anything coming from South America or India. The latter has its own, unique style of redials and that’s the “Bombay Special”, as I call it. 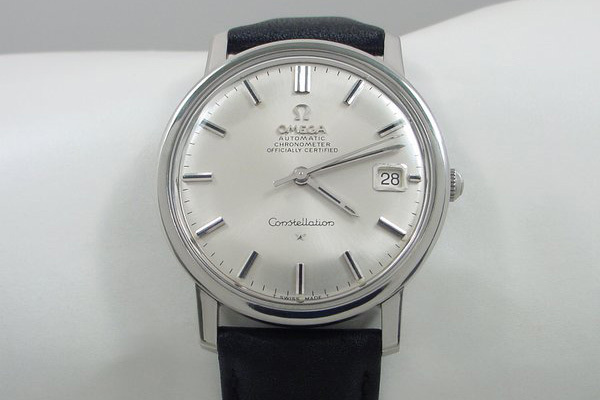 They’re of terrible quality and are often easily identifiable by the shoddy print, sharp colors that the manufacturer would have never used, and copying particular, recognizable styles, notably that of the Omega Ranchero. If you’ve seen one of them, you’ve seen them all. The Bombay Special is simply unique in how badly it’s done. Now, let’s move to the financial aspect of redials. Many sellers treat a redial as an investment and will charge a lot for a “restored” watch. To be clear, it’s not an investment. Every redial reduces the value of a watch. Both the collectible and the monetary value. No matter how well you restore a dial, it’s by no means worth more than the real McCoy. Not even the same. A half. Maybe a third of that. Or even a fourth, if we’re talking about value in relation to that of a flawless specimen. Of course, a redial is always done for a reason. It can be restoring a wreck, but it can also convert a less desirable model, for example, something from Omega’s Geneve collection, into a more desirable Seamaster. Or a “rare, black dial”. Black dials were generally unpopular until the 1970s, at least in watches other than divers or tool chronographs. But even in the latter, except the Omega Speedmaster, the Rolex Daytona, and the Heuer Autavia, bright dials were far more popular. If you ever need to have anything to do with redials, that should be in situations like an heirloom piece with a badly damaged dial with no NOS replacement available. Don’t buy redials. They’re not collectible, and they’re not worth your time and money. Are there collectible redials? A few, notably the Ministry of Defense redials. Commissioned by the MoD in the 1950s for the WW2 RAF-issued Omegas (the 6B/159 and the Fleet Air Arm HS8), and their 1950s successors (6B/542) repainted in the early 1960s in order to appropriately mark the use of tritium lume (a circled T on the dial- required by the British military watch specification). But even then, you can’t know for sure, if the MoD or some local watch handyman has done that. Should that be the case, don’t buy it if you can’t stomach an expensive failure. If you’re not sure, walk away. If you have doubts, you can always ask for help in watch forums. They’re full of helpful people, who will help with how to spot a redial. Always ask for help BEFORE you buy, not after. “After” is often too late. Stay away from watches from regions known for selling redials (India, Thailand, Hong Kong, Singapore, South America, Ukraine, Bulgaria, Romania). Unless you’ve already got some experience on how to spot a redial. Be careful with vintage watches from Japan. Japanese redials are extremely accurate, and therefore extremely difficult to spot. Vintage watch collecting isn’t perfectly safe but it’s still a fantastic hobby. I hope that this brief guide will help you enjoy it, and assist you in steering clear of the perils of the vintage watch market. Do you have some more tips on how to spot a redial? Please comment below. Really decent post. Oris and Tissot redials out of India are every on eBay. Sadly, not only Oris and Tissot. Mostly Favre-Leuba, but also Omega, Roamer, Eterna, even Rolex. Chrono24 is flooded with Bombay Specials as well.